Chicken Soup for the Pet Lover's Soul™ brand dog and cat food is proud to bring your dog a complete and balanced all natural dog food. Made from the finest, simplest ingredients including four fresh meats, vegetables, fruits, and whole grains, this puppy food provides a nutritious, well-balanced base for a happy, healthy, and wholesome dog. Helps slow down the effects of aging through a special combination of vitamins, minerals and antioxidants, plus contains glucosamine and chondroitin for optimal joint health. 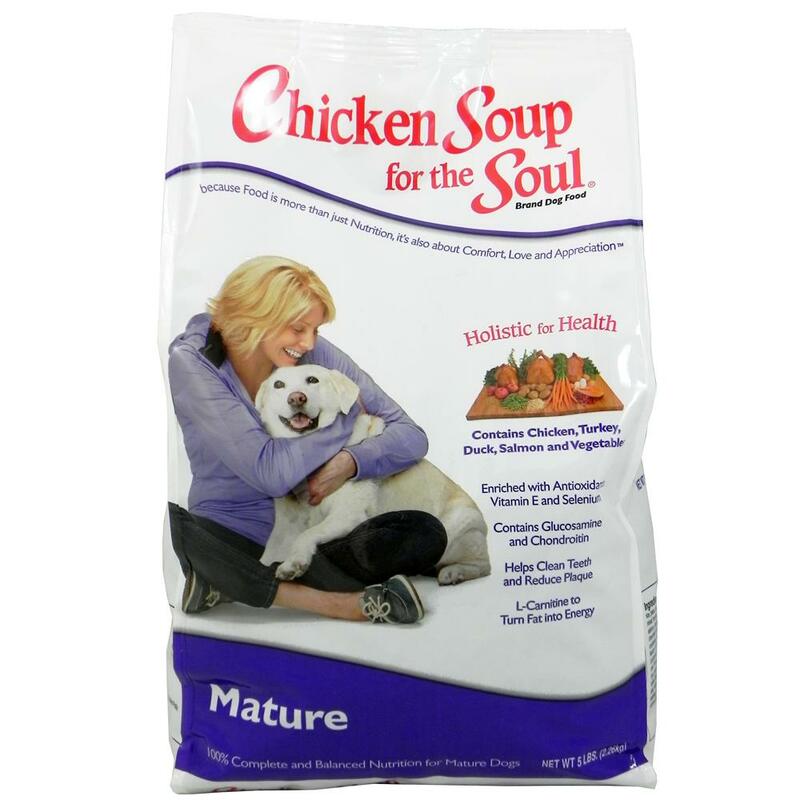 Chicken Soup for the Dog Lover's Soul Senior Dog Formula is formulated to meet the nutritional levels established by the Association of American Feed Control Officials (AAFCO) Dog Food Nutrient Profiles for maintenance. Chicken, turkey, chicken meal, cracked pearled barley, whole grain brown rice, oatmeal, millet, white rice, potatoes, ocean fish meal, chicken fat (preserved with mixed tocopherols), tomato pomace, duck, salmon, egg product, flaxseed, natural chicken flavor, potassium chloride, choline chloride, glucosamine hydrochloride, dried chicory root, chondroitin sulfate, kelp, carrots, peas, apples, tomatoes, blueberries, spinach, dried skim milk, cranberry powder, rosemary extract, parsley flake, yucca schidigera extract, L-Carnitine, dried fermentation products of Enterococcus faecium, Lactobacillus acidophilus, Lactobacillus casei and Lactobacillus plantarum, dried Trichoderma longibrachiatum fermentation extract, vitamin E supplement, iron proteinate, zinc proteinate, copper proteinate, ferrous sulfate, zinc sulfate, copper sulfate, potassium iodide, thiamine mononitrate, manganese proteinate, manganous oxide, ascorbic acid, vitamin A supplement, biotin, niacin, calcium pantothenate, manganese sulfate, sodium selenite, pyridoxine hydrochloride (vitamin B6), vitamin B12 supplement, riboflavin, vitamin D supplement, folic acid.